Are you looking for an Aldo student discount? Then you’ve come to the right place. We love this amazing shoe retailer with a fantastic array of mens and womens shoes, boots, sandals and a whole host more. And it always helps students to save when buying from aldoshoes.com. Right now students can get an Aldo student discount for 10% off. To get it, head to this page on aldoshoes.com. Then enter your NUS Totum number in the voucher code box at the online checkout and the reduction will be made. Full details and ts and cs are here. With schemes like Unidays, Student Beans and NUS plus promo codes, sales and outlets, it can be confusing and difficult to get all the money off that students are entitled to. That’s where Student Discount Squirrel comes in. We’ve been doing the research to find all the ways you clever learners can make savings on your footwear purchase. Great news. Currently there is a 10% Aldo student discount. To get it you need to have the NUS Totum card and it’s valid both in-store and online. Go to Aldo and make your fabulous purchase. At the online checkout enter ‘NUS’ and then your full Totum card number in the promo code box. The 10% discount will be applied. Yippee. But before you go, did you know that it’s possible to save even more on your fantastic footwear purchase. So the student discount is in the bag but while we were researching for this page we actually found that there are more ways to save that could save university and college students even more. Make sure you check the Aldo sales pages for reductions of up to 50%. It’s well organised into womens and mens sections and subdivided into footwear, accessories and handbags. Have a browse because you might find something better and cheaper! If you haven’t done already then sign up to the Aldo newsletter. As well as being packed with great shoes and boots fashion advice, you also get a one off voucher code to use online. Simply enter it at the online check-out. 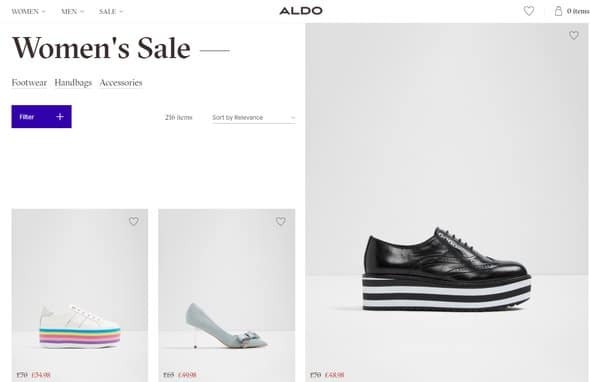 As well as the sales pages there are also the Aldo clearance pages. When we took a look there were boots with 75% off and shoes up to 60% off. These footwear items are usually low in stock, limited sizes and end of line but they still look absolutely gorgeous to us. Our world famous savings section is a quick way to check the latest ways to save at Aldo. In a hurry? Then this is the place. We list all the latest valid student discounts, promo codes, sales, promotions and more and helpful buttons to get you right there to the savings. This is at the top of the page so make sure you take a look. There are lots of questions that you inquisitive students have about Aldo so we’ve listed the most popular here to help you answer your queries. Does Aldo do a student discount? We can confirm that as of 2019 there is a standard Aldo student discount of 10% off. To get it you need an NUS Totum card and it can be redeemed both online and in-store. How do I get Aldo offers? If you are in an Aldo store then present the NUS Torum card at the check-out. If you are online, enter you entire Totum number in the promo code box at the online check-out page. Is there an Aldo Unidays discount? Unfortunately there is no Unidays scheme for Aldo. However, you can get an Aldo student discount with an NUS Totum card. You can also make additional savings by following our advice in our savings section. Does Aldo do an NUS Totum discount? Yes, we can confirm that students can get a 10% reduction either at the till or online at aldoshoes.com. See our previous section to find out how to get it. Is there an Aldo student beans discount? At the moment there is no affiliation with Student Beans. Clarks has a great range and you can usually find some discounted styles in our Clarks student discount guide. While there is no Debenhams student discount, they often have great reductions on branded shoes and boots – so worth checking out! Schuh sends a great range of fashionable footwear and they have a basic 10% student discount. USC have a good selection of shoes and reduction for students. Footasylum is a firm favourite with students all over the UK – check out their discounts in our super handy guide! It is a family company – the Bensadouns! Mr Bensadoun’s was a shoe retailer in Morocco and France – his father was a cobbler in Algeria! They know what they are doing. LOL! It’s first store in England opened in 2002! ALDO partners annually with with YouthAIDS to help stop the spread of HIV/AIDS and has raised £3.5million to date. Aldo isn’t your usual student brand, but it isn’t quite a premium one either. Quality is crucial with Aldo shoes and accessories, and there’s no doubt the longevity of these products will pay you back your mid-level investment well. No matter the type of shoe you’re after, you’ll find it at Aldo. Spanning men’s and women’s collections, with complementary bags and exercises, Aldo is truly the accent brand for any outfit. Quality is key, but also choice. The women’s range includes boots, ankle boots, heels, flats, trainers, sandals and block heels, and the men’s, boots, casual boots, formal shoes, casual shoes and trainers! Everything is Aldo’s own design and brand, but there are a few designer collaborations – all exclusive and hard-to-find. Aldo’s collabs are notoriously popular, so if you find a pair of these special shoes you like, snap them up fast before they go. Don’t worry about getting good wear out of them, either; there’s a whole range of shoe care products to keep them shiny and ship shape out and about! And that’s not where it ends: women can choose from backpacks, bum bags, cross-body bags, totes, top-handle bags, clutches, evening bags, purses and wristlets! That’s before you even start on the accessories, which span jewellery, hats, scarves, gloves, socks, tights and sunglasses. There’s pretty much nothing they don’t stock, so once you’ve got the perfect outfit for your occasion, check in to an Aldo store or online to put together the finishing touches and details. Aldo don’t currently do a student discount as standard, but here at Student Discount Squirrel we’re always on the lookout for deals and offers – so keep checking back here and we’ll update you as soon as we find any way of shopping with Aldo that little bit more affordable. Aldo was founded in 1972 as a shoe company in conjunction with Le Chateau, a French-Canadian fashion business, run by Aldo Bensadoun, whose father was a shoe retailer in Morocco and grandfather was a cobbler in Algeria. The group quickly opened stores in Quebec, Winnipeg, Montreal and Ottawa. By 1987, Bensadoun had learnt Italian to directly communicate with his European suppliers and streamlined the business by cutting out the middle man and bypassing usual supply chains. Aldo began to expand in 1990, taking a tentative step into the US by opening a single store and trying out different concepts across the border. Despite Canadian businesses not typically easily succeeding in America at the time, Aldo found a winning formula and began to open more shops slowly but surely. Following this, the business moved into Israel, Saudi Arabia, England and Singapore – and today boasts over 3,000 stores spanning three internationally-focused brand names. The other two brand names carry Aldo products but are tailored to appeal to slightly different audiences, known as Call It Spring and GLOBO. Call It Spring is a concept offering more affordable and casual shoe options within larger department stores, and as a result, has a larger worldwide spread even than Aldo itself. GLOBO is aimed at families, stocking footwear for all ages and of all types. That said, neither are currently available in the UK. Aldo were a victim of controversy in the noughties as a result of undercover findings discovering they weren’t always paying minimum wage – but it has now all been cleared up and everything brought above board, so you can shop guilt-free knowing that everyone in the supply chain is being paid a fair wage: it’s just that the media tend not to report on the calm after the storm!